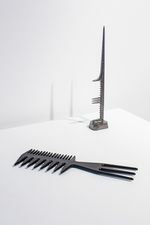 The Contemporary Austin and grayDUCK Gallery are pleased to present the exhibition The Honesty of Rocks, featuring work by nine artists who participated in the museum's 2016 Crit Group—a program that combines group critique with professional development to advance the complete artistic practice of established and emerging local artists. This eight-month-long program gives local artists the chance to strengthen their practices with input from internationally recognized professionals in the field. Crit Group is organized by The Contemporary Austin’s Director of Public Programs and Community Engagement, Andrea Mellard, and co-facilitated by art historian and curator Sarah Bancroft (previously of the Guggenheim Museum, now Director of the Rosenquist Foundation and Associate Director of Curatorial Affairs at Fluent~Collaborative/testsite) and curator, critic, and instructor Dr. Andy Campbell (USC Roski School of Art and Design and former Core Fellow Critic-in-Residence). 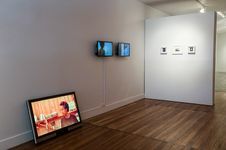 The culmination of the eight-month Crit Group program, The Honesty of Rocks spans the disparate work of these nine compelling Austin-based artists, each connected by their intense desire to hone their practices and their rigorous investigations of the subtleties of contemporary life. 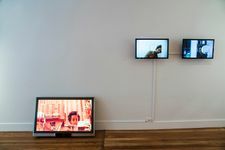 The exhibition includes video, sculpture, photography, painting, installation, and performance by participants of The Contemporary Austin’s 2016 Crit Group: Emma Hadzi Antich, Amy Bench, Ted Carey, Christina Coleman, Lauren Klotzman, Josef Kristofoletti, Betelhem Makonnen, Rebecca Marino, and Amber Shields. 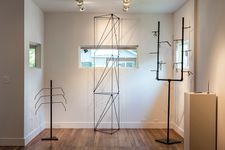 The exhibition’s title is taken from Ted Carey’s artist statement, and is reflective of an interest, shared by many Crit Group participants, in the politics and poetics of materiality. Synthetic hair, for example, is put into dialogue with science (and science fiction) in Christina Coleman’s antennae-like sculptures, while the compressing and layering of information in Lauren Klotzman’s video installation addresses the seeming immateriality of digital media. Rebecca Marino’s recent work puts gendered representation into relationship with a low-tech use of soft materials in photography and sculpture that explore Dr. Anna Lee Fisher, the NASA astronaut dubbed the “first mother in space.” Underlying each of these material explorations is an interest in vulnerability and futility. These themes take shape in Carey’s poetic combinations of detritus and high-key color, which are celebrations of impermanence. 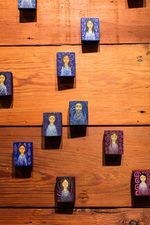 Both Amy Bench and Amber Shields picture loss—whether depicting the unpeopled, aged interiors of churches and social halls, or Shields’s relationship with her grandmother at the end of her life, respectively. 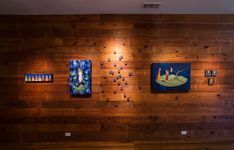 Mural painter Josef Kristofoletti consistently pushes his own practice towards new and imaginative states, and will execute a new work on a wall of the gallery. Two others examine the vulnerability of history itself: Betelhem Makonnen's photo- and video-based work presents "the archive” as a mirror-house of representation questioning the notion of history and its relationship to the present, and Emma Hadzi Antich redeploys the aesthetics of Greek Orthodoxy and ancient philosophy to examine the role of myth in today’s social interactions.